To control and navigate spacecraft. To use tools, cameras, and scientific instruments in flight. To operate outside a spacecraft protected only by a spacesuit. To carry out rendezvous and docking with another spacecraft launched separately. To guide a returning spacecraft through the atmosphere to a selected landing area. Thus far men's activities in space have been limited to the region immediately surrounding their native planet. The deepest venture into space during NASA's first decade was that of Astronauts Charles Conrad and Richard Gordon, whose Gemini XI spacecraft, docked with an Agena propulsion system, climbed to an altitude of 853 miles over Australia in September 1966. But as the Apollo space vehicle and its supporting ground equipment approach readiness, men are poised for a leap across the void in the mission to the Moon, a quarter million miles away. The first man to depart from Earth was a Soviet cosmonaut, Yuri Gagarin. His Vostok I carried him around the world on April 12, 1961. later that year another Soviet cosmonaut, Gherman Titov, spent a day in orbit before returning safely, and two American astronauts, Alan Shepard and Virgil Grissom, made suborbital flights of 300 miles to test the Mercury spacecraft. Orbital flights by American astronauts began in 1962. John Glenn and Scott Carpenter made three revolutions each, and Walter Schirra extended this to six revolutions for a total of 9 hours in flight. That same year Soviet Cosmonauts Andrian Nikolayev and Pavel Popovich carried out the first dual space mission involving- two vehicles launched separately. Nikolayev went into orbit first and Popovich followed a day later. Both stayed aloft for an additional 3 days, in orbits that brought their craft within 4.3 miles of one another. In another dual mission the next year, Cosmonaut Valery Bykovsky was in orbit 5 days and a Soviet woman, Valentina Tereshkova, was aloft 3 days: they came within 3 miles of each other in space. The United States concluded its Mercury program in 1963 with a flight by Gordon Cooper that lasted 34 hours. The first spacecraft to carry more than one passenger was the Voskhod I in 1964. In its crew were the late Vladimir Komarov, a pilot: Konstantin Feoktistov, a scientist: and Boris Yegorov, a physician. The photographs on the next four pages were taken from American single-passenger spacecraft. The others in this section were taken from the two-man Gemini: the United States first launched its Gemini for testing without a crew in 1964. "Sky is the part of creation," John Ruskin wrote long before men soared into it, "in which Nature has done more for the sake of pleasing man, more for the sole purpose of talking to him and teaching him, than in any other of her works...."
American astronauts groped for words to describe their feelings when they looked homeward from the sky, and hastened to record on film what they saw. Astronaut SCOTT CARPENTER said of the sunset above: "The beauty of this panorama is overwhelming. The brilliance of the colors and the sequence in which they appear defy description, and I was anxious to record it photographically so others would understand. Even at that time, however, I was consoled by the thought that, in contrast to the ever-changing aspect of sunrises and sunsets as seen from the surface of the Earth, those viewed from space were destined to be forever the same." 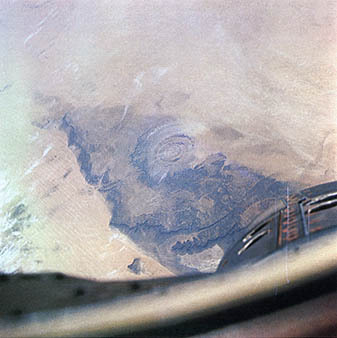 Astronaut JOHN GLENN wrote of the photo at right: "This picture of the Atlas Mountain range in Morocco was taken during the first orbit of the FRIENDSHIP 7 flight on February 20, 1962. 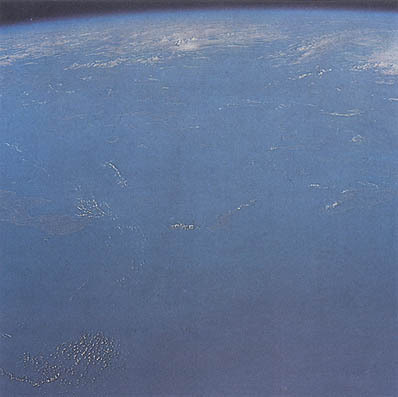 Since this was the first U.S. manned orbital flight, this was the first landmass picture taken following launch approximately 23 minutes earlier. On this Right I used a 35-mm hand-held camera. Probably the most significant thing about the photograph is that it pointed out to all of us the value pictures from space would have for mapping, weather analysis, etc., in work that has since been refined to a high degree with other equipment on other flights and other projects." JOHN E. NAUGLE, Associate Administrator for Space Science and Applications, NASA, recalls: "This is the first photograph of the night airglow taken from above. 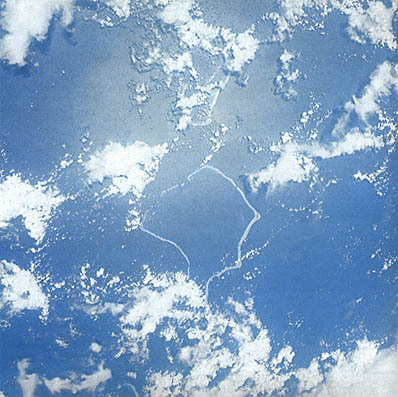 It was taken by Gordon Cooper during his orbital flight of May 15, 1963, for an experiment conducted by Edward P. Ney, W. F. Hutch, and F. C. Gillett of the University of Minnesota. 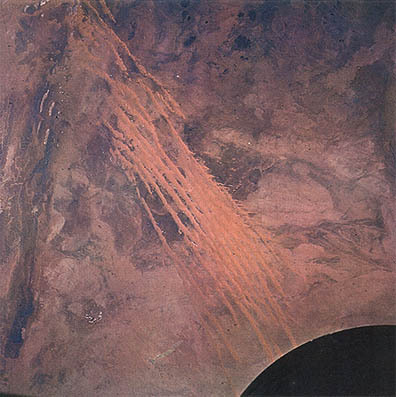 The photograph is a 2-minute exposure taken early in the satellite night as the spacecraft faced backward over the eastern coast of Australia. The flashes in the foreground are individual lightning discharges from four active regions in a storm. The successive flashes recede into the distance as the spacecraft moves away from the storm. The airglow layer, very much smeared by spacecraft motion, is the greenish band which begins about an inch in the photo above the horizon as delineated by the lightning flashes in the distance. This and other photographs show an airglow layer 24 kilometers thick and 77 to 110 kilometers above the horizon." 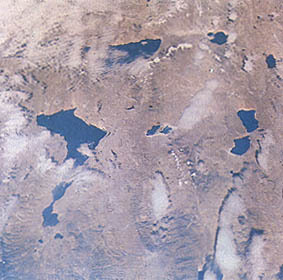 Astronaut GORDON COOPER wrote of this picture: "The Tibetan lake country was very distinctive in that our orbits were over primarily lower altitude terrain of Arabia and India-then rather abruptly you came upon this higher terrain with sandy-colored soil, interspersed with numerous lakes. You can see patches of snow scattered about the ridges and many of the lakes are partially choked with ice. The air is very clear in this area. This is one area where brown and green colors appear as they are, rather than with a bluish tint from haze and humidity." 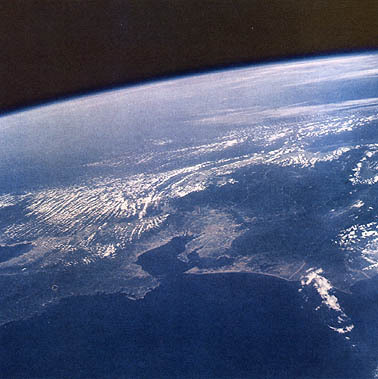 ROBERT R. GILRUTH, Director of the Manned Spacecraft Center, NASA, points out: "This photo of the Himalayan region is almost vertical from an altitude of approximately 90 nautical miles. The China-Nepal border zigzags across the lower half of the picture. The largest single feature, approximately in the left center, is the completely snow-covered Gurla Mandhata Massif, with a peak elevation of 25 335 feet. The high peaks in Nepal are cloud covered, but the clear view of the Tibetan region shows much hitherto unknown detail of this remote and poorly explored area of Asia." The first two Gemini flights demonstrated the structural integrity of the U.S. first two-passenger spacecraft and the performance of the launch vehicle and spacecraft systems. The third was a three-orbit manned flight, and the fourth a 4-day manned flight, on both of which the astronauts photographed the Earth. The next seven pictures are examples of the results. Astronauts James A. McDivitt and the late Edward White took them in June 1965 during their 4 clays in space. The camera used was a modified Hasselblad, Model S00 C, with a Zeiss planar lens of 80-mm focal length, and the film was Ektachrome MC (S.O.-217). The highest altitude reached was 175 miles, and the lowest point while in orbit was 100 miles. 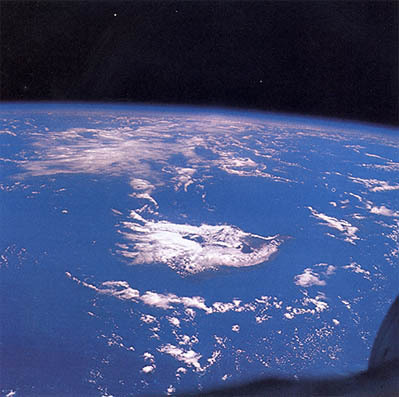 The 219 color photographs brought back by the men aboard Gemini IV demonstrated the potentialities of viewing the ocean's surface and door, the shorelines of continents and islands, and the great variations in terrain from high altitudes. The photograph on the next page, for instance, was of especial interest because of a cautionary statement in the U.S. Naval Oceanographic Chart HO-5394, "Crooked Island Passage," dated November 1965. It read: "The charted position, size, shape, and orientation of the islands in the Bahama islands are unreliable." When the outlines of the charted islands and those in photographs of the Bahama Islands taken from space were compared, the validity of this warning was readily apparent. These islands ate close to the United States and men have sailed through the passages between them for hundreds of years, yet never could see the contours before in the way they were visible in photographs taken from spacecraft. 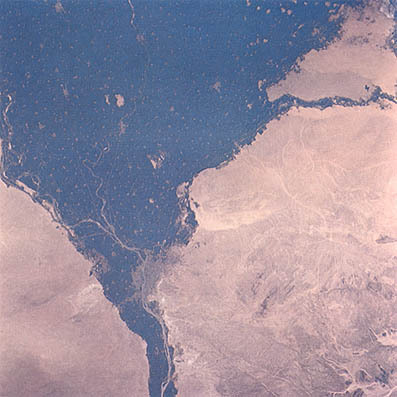 On this same flight, two famous river mouths, those of the Nile and the Colorado Rivers, were photographed as entities for scientists examining interactions between such features of the Earth and men's activities. These unprecedented views are reproduced on pages 144 and 145. The picture of the Colorado River's mouth was one of a series of overlapping photos of North America which, when viewed together, tell scientists more than can be ascertained from a single photograph. 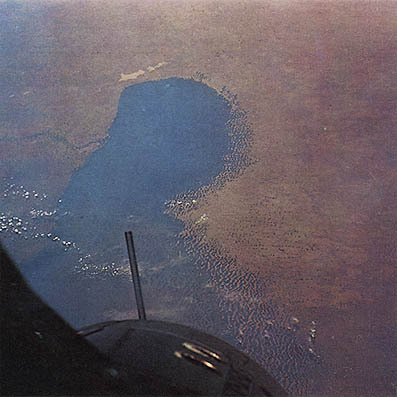 The other Gemini IV pictures shown here include desert areas of both the Old World and the New World, an enormous structure in Mauritania that has long puzzled geologists, and finally the Florida Keys, an area with which many Americans have long been familiar. "Acklins and Crooked islands in the Bahamas," says ROBERT E. STEVENSON of the Bureau of Commercial Fisheries, Department of the interior, "are typical of shoals and islands that rise abruptly from depths of 2000 meters in these waters. Sunlight reflecting from brilliantly white calcareous sand at depths less than 5 meters produces the vivid light-blue color around the islands. The wave pattern and current eddies in the reflection from the Sun are formed around nearby banks, with narrow, bright, irregular sea slicks indicating the water motion. A spacecraft offers a new means of charting shoals and shorelines." 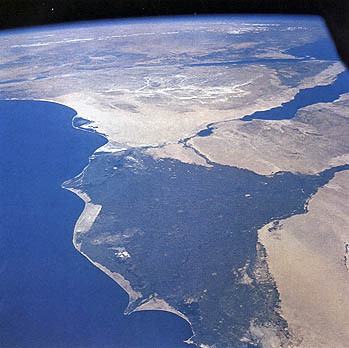 "For centuries man has looked on the Nile Valley as one of the cradles of civilization," Astronaut FRANK BORMAN noted. Generations have explored, excavated, and interpreted the significance of the Nile and its delta, but it was not until 1965 that the world received its first panoramic view of this sprawling spectacle on the northern coast of Africa. This picture revealed, for the first time as an entity, the 500 000-square-mile delta with its collar of wind-whipped rock and desert. This photograph became an important data point in man's quest to understand his environment." This photograph, says ROBERT O. PILAND, Manned Spacecraft Center, NASA, "is one of an overlapping series extending from the Pacific coast of Mexico to central Texas. 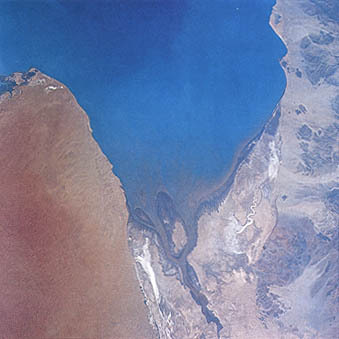 This frame shows the Colorado River entering the Gulf of California. Considerable geologic detail is apparent. The sinuous pattern in the gulf was originally identified as turbidity currents. The Naval Oceanographic Office has since demonstrated that this pattern is the bottom topography of the gulf, which is relatively shallow in this area. An orbital view of sediment distribution can be of great value to oceanographers." "In the southwestern portion of the Rub al Khali, or Empty Quarter on the Arabian Peninsula," says RICHARD W. UNDERWOOD of the Manned Spacecraft Center, NASA, "we see the long, parallel 'seif' dune ridges which run unbroken for up to 400 miles and in some instances are 500 feet in height. The hollows between the ridges expose the bedrock and gravel flats. The background shows part of Arabia's Hadramawt Plateau. This portion of Arabia is poorly explored. Photographs which show such large portions of the Earth's surface provide information previously denied the geoscientist." "An area approximately 70 miles on a side within the picture, says A. H. CHIDESTER of the Astrogeology Branch, U.S. Geological Survey, "is in the Sonoran Desert in Mexico. It encompasses a surprising range of climatic conditions, from the barren desolation of the Desierto del Altar to the lush vegetation of the 'arboreal desert.' Geologically the area is famous for its fine display of volcanic features. Complex volcanic mountains, cinder cones, wide craters, and flows are clearly visible in the photograph. Two of the maars have served as sites for training astronauts in field geology." " The 22-mile-wide Richat structure in Mauritania is one of the most spectacular geologic features in Africa," according to PAUL. D. LOWMAN, JR of the Goddard Space Flight Center, NASA. "Resembling a gigantic bull's-eye, the Richat is a series of concentric ridges of resistant sedimentary rock. Structurally it is a domal uplift: its innermost rocks are Lower Cambrian limestones, surrounded by progressively younger rocks. The origin of this immense dome is not clearly understood. This synoptic view of the entire Richat structure and the surrounding area may throw new light on its origin." 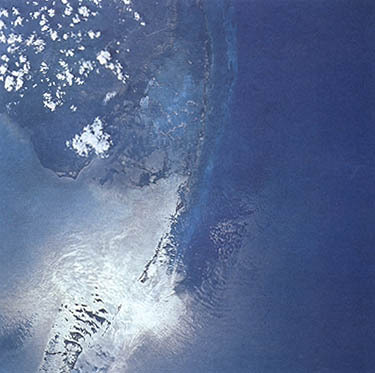 "The Florida Keys and the tip of the mainland were photographed as part of an experiment in synoptic terrain photography," says CHRISTOPHER C. KRAFT, Director of Flight Operations, Manned Spacecraft Center, NASA. 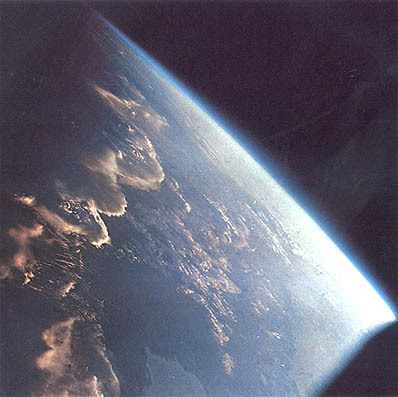 "This photograph represented a new era in the study of the Earth and its resources, just as Gemini IV represented the beginning of a new era in long-duration manned space flight." The Everglades are in the upper left. An angular line in the upper center is a road leading to Key Largo. Shoal areas from there to Boca Chica Key are visible. The whitish area is Sun glitter on the water. 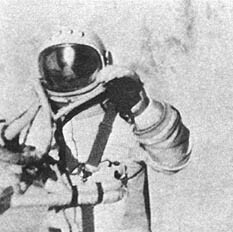 "Having satisfied myself that all of Alexei Leonov's life-support systems were functioning normally and his pulse and respiration were normal, I, at the prescribed time, gave him the order to emerge into outer space. During the period when Leonov was in outer space, I followed all his actions using a TV installation for this purpose. The TV camera operated very well and clearly. I saw in detail all the actions conducted by Leonov in outer space. I was in constant communication with him by telephone, and the instruments in the cabin helped me to check the functions of his individual life-support system. All the movements along the spaceship's outer shell as well as pushes could be heard distinctly inside the ship. Thus, besides all the envisaged systems for control of the cosmonaut's movements in outer space, there appeared an additional sound system of control. "The cosmonaut's entry into the spacecraft was carried out in precise accordance with the program." "The flight helped to demonstrate the feasibility of EVA and the usefulness of a maneuvering unit when not in contact with a spacecraft." 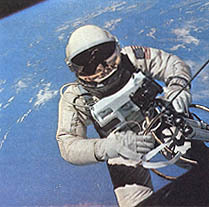 Extravehicular activity later proved somewhat more difficult than was anticipated, and Astronaut Edwin E.. Aldrin, Jr., who is shown engaged in it on pp. 183 and 184, used body tethers and handholds. With these, he successfully obtained experience in the performance of basic tasks with electrical and fluid connectors, hook-and-ring combinations, plastic strips, and fixed and removable bolts. 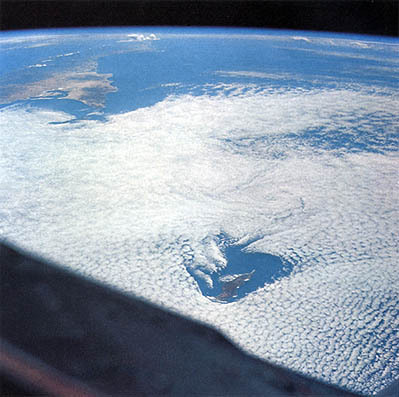 Astronaut EDWARD H. WHITE's recollections were as follows: "This was a picture taken by my teammate, James A. McDivitt, on the third revolution of Gemini IV. I had a specially designed spacesuit which had 21 layers of thermal and micrometeoroid protection. My face was protected by a double goldplated visor which provided protection from the unfiltered rays of the Sun. In my hand I held a small self-maneuvering unit which gave me control of my movements in space. On my chest was an oxygen chestpack that regulated the flow of oxygen to my suit and provided an 8-minute supply of emergency oxygen. 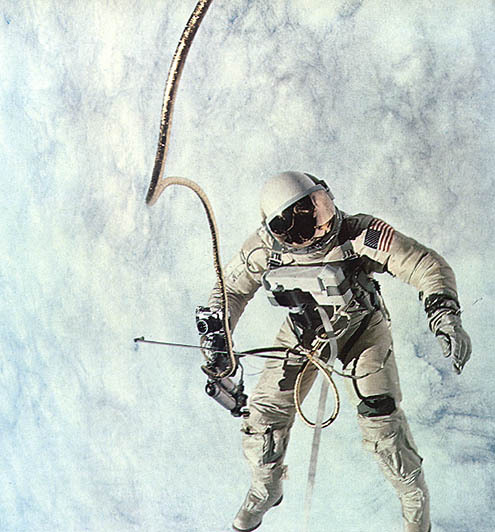 I was secured to the spacecraft by a 25-foot umbilical line and a 23-foot tether line, which were secured together and wrapped with a golden tape for thermal insulation. On the top of the hand-held self-maneuvering unit was mounted a 35-mm camera to record the event from outside the spacecraft." Astronaut White died 2 years later, with Astronauts Virgil Grissom and Roger Chaffee, when fire swept the interior of an Apollo spacecraft at Cape Kennedy. Flight durations grew longer in 1965. In August, Astronauts L. Gordon Cooper and Charles Conrad, Jr., circled the world 120 times, in 190 hours and 55 minutes, and returned with 250 photographs in color. They used a NASA-modified hand-held Hasselblad, and both Ektachrome MS (S.0.-217) and Anscochrome D-50 film. The nine examples of their work which follow show areas where Earth's lands and waters meet. 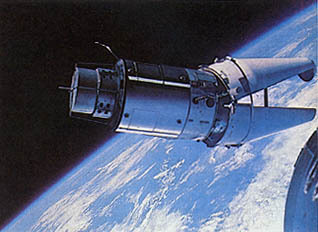 All of the Gemini flights were within a band extending from 30° N to 30° S. Hence none of these portraits of the Earth's surface includes the difficult-to-explore regions near the poles. Even so, they show great variations in the contour of the surface and demonstrate the advantages of space photography in both thinly and densely populated areas. Like many other Gemini photographs, the one on the facing page encompasses a broad span of scientific disciplines. For the meteorologist, there are cirrocumulus cloud formations indicative of the wind activity off the coast of California. The coastline is well defined, and the absence of sediment offshore is characteristic of a dry summer that resulted in little runoff. The haze layer covering Los Angeles is typical of the season in that wind patterns aided by the surrounding mountain ranges tend to amplify that area's smog situation. Farther inland, a broad sweep of the mountain ranges and the desert beyond are visible in fair detail for the geologist. The other pictures in this section include new and spectacular views of the first part of the New World to be described by Europeans, the Bahama Islands and the peninsula of Florida. These are followed by one of islands in the Mediterranean that have figured prominently in men's affairs for centuries, three pictures of Africa, and two more taken over the Pacific Ocean. "As pressures on natural resources increase, because of growing populations and rising standards of living," Robert N. Colwell of the University of California at Berkeley told Scientific American readers in January 1968, "it becomes steadily more important to manage the available resources effectively. The task requires that accurate inventories of resources be periodically taken. Until as recently as a generation ago, such inventories were made almost entirely on the ground. Geologists traveled widely in exploring for minerals foresters and agronomists examined trees and crops at close hand in order to assess their condition; surveyors walked the countryside in the course of preparing the necessary maps. The advent of aerial photography represented a big step forward." Photography from orbiting platforms represented a further advance. So, too, did improvements in cameras and the development of additional remote sensing apparatus. Many bands of the electromagnetic spectrum outside of the visible-light portion now can be used to obtain information to supplement that provided by conventional photography. Gemini V photography greatly encouraged the Earth Resources Survey program in which NASA is participating with such user agencies as the Department of Agriculture, the Department of Commerce, and the Department of the Interior. The program's overall objectives are to determine those Earth resource data that best can be acquired from space, and to develop further man's technological capabilities. "It was 3 minutes past 11 o'clock in Los Angeles, on the far left, when this photograph was taken," says SAMUEL H. HUBBARD, then Special Assistant, Gemini Programs, NASA. "San Clemente island and Santa Catalina island resemble steppingstones leading to Long Beach. The coast is visible from about Malibu to Bahia del Descanso, Mexico, the indentation on the extreme right. The inlet right of center is San Diego Bay, and the mountain ranges around Los Angeles are in the background. Behind them lies the Mojave Desert. 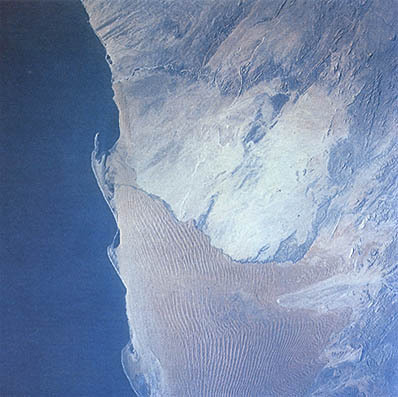 The imperial Valley and the Salton Sea are in the upper right." "Clearly visible here," KURT H. DEBUS, Director of the John F. Kennedy Space Center, points out, "is the peninsula which has been the setting for all NASA manned flights and many of the unmanned scientific space exploration missions. Launch complexes, road networks, and the causeways connecting Cape Kennedy and the adjacent John F. Kennedy Space Center with mainland Florida can be readily identified. 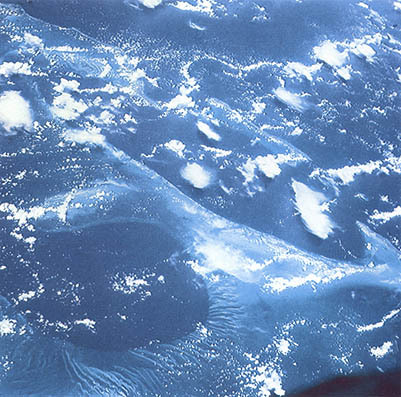 The Gemini photography demonstrated the capabilities of photographing Earth landmarks from an orbiting spacecraft. Succeeding manned missions employed these photographs for reference." "This striking photograph has done mach to galvanize the thinking of scientists to the possibilities of doing oceanography from space," says ARTHUR ALEXIOU of the National Science Foundation. "The lower left shows the Tongue of the Ocean, a deep-ocean reentrant incised into the Great Bahama Bank. To the east are Exuma Sound (a similar channel) and the Cat, Great Exuma, Long, and Eleuthera Islands. The sharp color demarcation hints the channel walls mast be very steep. The unexpectedly clear definition of bottom topography suggests use of space photography for mapping it." 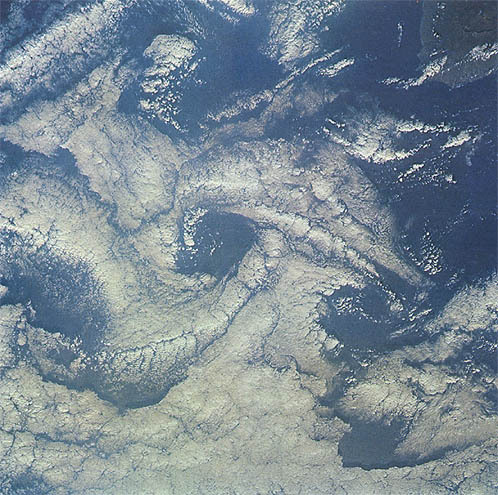 The clockwise stratocumulus cloud spiral at the left was northwest of Ifni, a Spanish possession surrounded by Morocco. Inland are 7700-foot peaks of the Anti-Atlas Mountains and the Jabel Quarkziz. The spiral, says NORMAN G. FOSTER, Manned Spacecraft Center, NASA, "represents a lee eddy induced by the airflow around Cape Rhir to the north. Tals Mountain peaks also influenced the formation. Tiros X photographed this area about an hour later. A detailed comparison of the two views was published by the Department of Commerce in the May 1966 Monthly Weather Review." "This picture of southwest Africa covers a complex geological and geographical area that has not been fully exploited but that is of proven economic importance, says RICHARD J. ALLENBY, Deputy Director, Manned Flight Experiments Office, NASA. "The northern flowing Bengula current has shaped the encroaching land sands into a series of great hooks. Walvis Bay, the chief port of southwest Africa, is inside the northernmost sandhook, protected from the Atlantic by 5-mile-long Pelican Point. A strip of the coast extending south out of the picture is a restricted diamond mining area." Over the Mediterranean Sea this photo was taken. 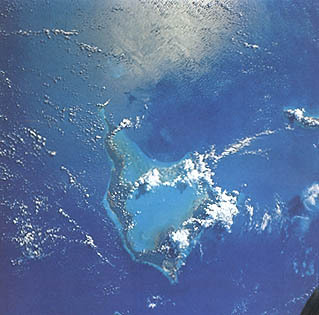 "The islands of Crete, Carpathos, and Rhodes are in the center foreground from left to right," says JOHN R. BRINKMAN, Chief, Photographic Technology Laboratory, Manned Spacecraft Center, NASA. "The view is toward the north-northwest looking into the Aegean Sea. The Cyclades islands are in the upper-left center; the northern Grecian mainland is under the cloud cover in the upper center. The coast of Turkey can be seen on the extreme right. One could, if desired, pinpoint renowned and ancient battlefields in this picture." This view of the Nile Delta covers nearly 500 square miles. "Gross land-use patterns are apparent, notes ARCH C. GERLACH of the U.S, Geological Survey. "Dark, irrigated croplands contrast sharply with the desert. 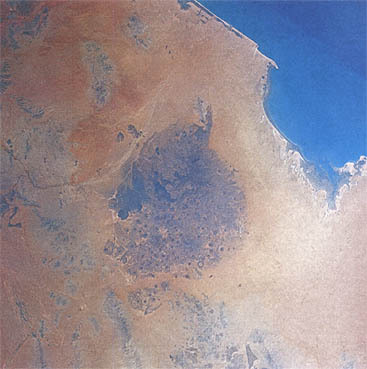 Light spots show the extent and shape of nearly 400 populated places, of which the more conspicuous are Cairo near the delta apex (in lower center), Banha and Zifta-Mit Gamr along the Nile to the north, and Tanta in the upper left corner. The apparently trifold distribution of urban centers has theoretical importance as a support for Christaller's central place theory applied to deltas." 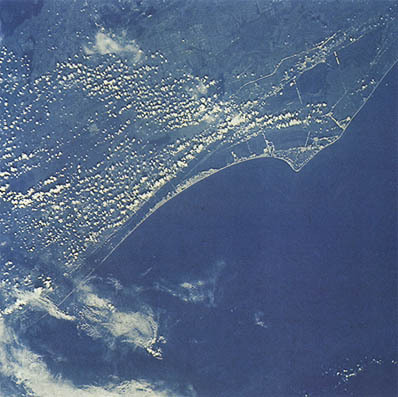 "Honshu, the largest of the four main islands of Japan, is shown here with the Pacific Ocean in the foreground and the Sea of Japan in the background," reports one of the principal investigators for the Gemini synoptic terrain and weather photography experiments, PAUL D. LOWMAN, JR., of the Goddard Space Flight Center, NASA. "Osaka, a city of more than 8 million, is situated at the far left on Osaka Wan (bay). The port of Nagoya is at the upper right edge of Ise Wan in the foreground." Honshu is a mountainous island with a coastline that has both steep cliffs and lowlands with fine harbors. "Here the island of Hawaii with its volcanic peaks of Mauna Loa and Mauna Kea is veiled by Pacific clouds, STANLEY SOULES of the National Environmental Satellite Center has pointed out. "Partly hidden by the clouds on the right are the islands of Maui, Kahoolawe, Lanai, Mokokai, and Oahu." Populated first by men navigating by the stars in double-hulled canoes, the State's many islands and islets extend across the Pacific for 1600 miles and have figured increasingly in world affairs. Mark Twain called this "the loveliest fleet of islands that lies anchored in any ocean." There are 34 atolls and hundreds of coral reefs in the Marshall islands. "This picture," says WlLLIS B. FOSTER, Director, Manned Flight Experiments Office, NASA, "includes all of Rongelap (in center), Alinginae (at top), and a tip of Rongerik (at bottom). Rongelap is about 60 miles long. All three are typical North Pacific atolls, consisting of an annular reef, probably Iying on top of a truncated volcano. Islands along the reef can be built, moved, or destroyed by a single storm or by subsidence of the volcano, Photos such as this will add immeasurably to study of their formation, life, and death." 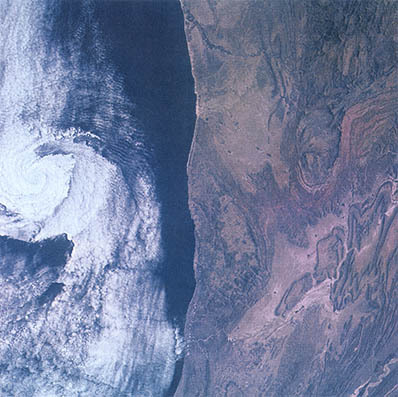 Guadalupe Island, Mexico, is in the foreground and Baja California in the background of this photo of a double vortex in stratocumulus clouds. "Such vortices, says KENNETH M. NAGLER, Chief, Space Operations Support, Environmental Science Services Administration, "are produced when the wind flows past the mountain island (a peak of 4257 feet) in much the same way that eddies are induced by an obstruction in a flow of water. Although these vortices are not related to severe weather, their formation and movement is under investigation-largely to determine what they reveal about the atmosphere." 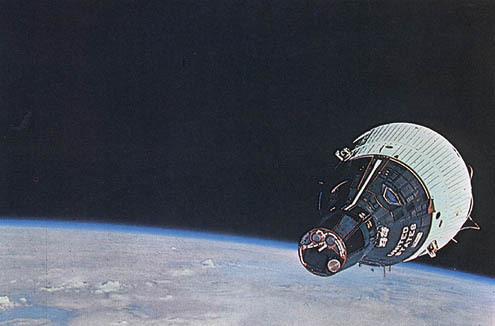 In December 1965, two Gemini spacecraft were aloft at the same time. In Gemini VI, Walter M. Schirra, Jr., and Thomas P. Stafford went around the world 15 times, and in Gemini Vll, Frank Borman and James A. Lovell, Jr., completed 206 revolutions -taking more pictures, frequently with the same kind of Hasselblad used on earlier flights, from altitudes that ranged up to 200 miles. Gemini VI was piloted into the same orbit as Gemini Vll and the two craft remained together for more than S hours, at times only a foot apart. My first indication, Astronaut WALTER M. SCHIRRA, JR., wrote of the picture below, "was that there was an exceptionally bright star out there, probably Sirius. A good look at the constellations in the Sirius and Orion area indicated no bright star at that location. It had to be spacecraft Vll. It disappeared like a light going out when it went behind the terminator at 43 miles' range. When we both came into the sunlight again, we were at rendezvous. On the next revolution, Tom [Astronaut T. P. Stafford] took this photo." 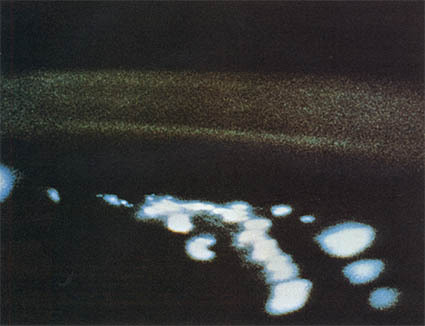 The picture at the right was taken from Gemini VI of Gemini Vll while they were about 13 feet apart on December 15, 1965. 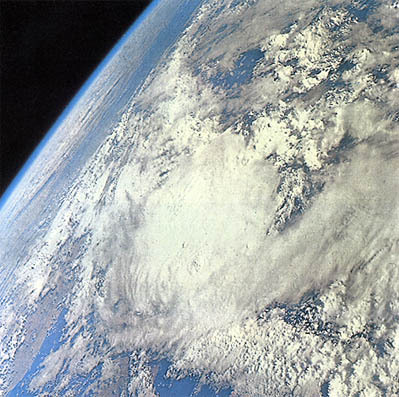 Astronaut THOMAS P. STAFFORD, remembers: "The ability to take this photo was very gratifying after the numerous delays we encountered in performing the world's first rendezvous mission. The Gemini VI spacecraft was launched on the third attempt to perform the rendezvous and performed it flawlessly. After the hard work and effort of over a year, we finally achieved the key step that will lead us to the lunar-landing mission. The sight was utterly fantastic to fly in close formation as we have done for many years in fighter aircraft, but at 17 000 miles an hour. The photo illustrates that man can control a space vehicle with preciseness in close vicinity to another vehicle." "One of the tasks of Gemini VI was to inspect the condition of Gemini VII after 12 days of space flight," Astronaut JAMES A. LOVELL, JR., wrote as a caption for the lower picture here. 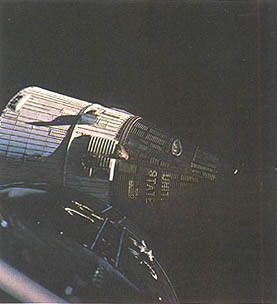 "The photograph shows the operation being conducted along the right side of Gemini VII. Clearly visible are the atmospheric heating effects in the paint of the words 'United States' and in the U.S. flag. In the center of the spacecraft can be seen the buildup of frozen urine particles on the triangular red-rubber structure accumulated after 12 days of dumping. On the white adapter area just behind the shadow of the infrared sensor door are scattered particles of frozen fluid vented from that device. 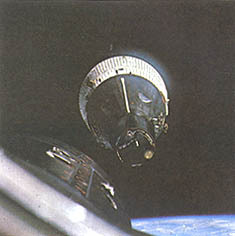 A close examination of the window will reveal me peering anxiously out of the corner as Gemini Vi disappears behind us. The rendezvous of Gemini Vi with Gemini Vii was a milestone in space flight. It was the first opportunity to closely examine a space vehicle in orbit and proved our concept of rendezvous." 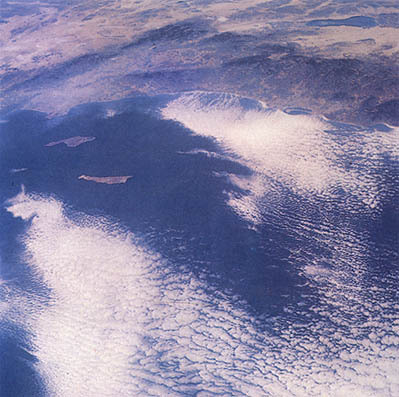 "The initial impression is that this photograph indicates a tropical-storm-cloud system," KENNETH S. KLEINKNECHT, Deputy Manager, Gemini Program, Manned Spacecraft Center, NASA, says of this picture in which Baja California and the gulf between it and Mexico are discernible. "Closer examination reveals a cloud mass associated with a low-pressure center. The large, circular cloud pattern in the center is thick altocumulus. Gemini photographs have given men a clearer understanding of weather phenomena, as well as information to aid in interpretation of weather-satellite photographs." This "majestic roof, fretted with golden fire" lay below Gemini Vll as it crossed South America. "The low angle of the setting Sun produced this unusual glow of clouds along the Andes Mountains," says LEROY E. DAY, Apollo Program Test Director. "This picture looks south from northern Bolivia across the Andes Mountains, and illustrates the extensive cloud cover seen in that area. The Gemini Vll mission produced a wealth of medical, scientific, and operational data which clearly established man's ability to work usefully during a 2-week space flight and return to Earth in good health." "When northeast winds blow past the mountainous Canary islands," says STANLEY SOULES of the National Environmental Satellite Center, "they frequently are swirled into eddies that show up in the stratocumulus clouds. 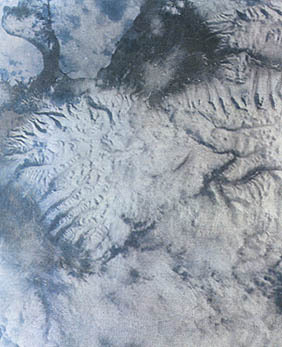 The 12 198-foot cratered mountain on Tenerife is in the upper right, and Gomera, partly hidden by clouds, is farther left. The eye of the center eddy is about 13 miles across. Two other eddies rotating clockwise are near it. The cloud tops are about 3500 feet high. A temperature inversion exists at this altitude and a chain of eddies analogous to a Karman vortex street has formed downwind." Natives call this harsh, lifeless plain in Africa's western Sahara the Tanezrouft, or "Land of Terror." 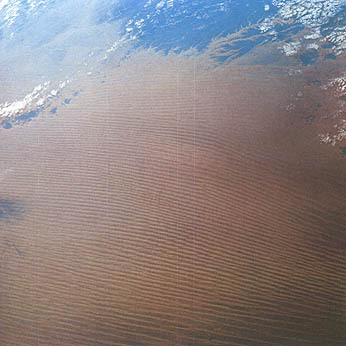 PAUL E. PURSER, Special Assistant to the Director, Manned Spacecraft Center, NASA, says: "The long stripes from northeast to southwest are 'seif'-type sand dunes. The sand, obviously blown in from a distant area, is slowly migrating across the bedrock. Photographs covering such large areas provide a great deal of data on such regional migrations of sand dunes and their geomorphologic aspects. The continuity of features and their gradations are often masked in mosaics of low-altitude photographs." 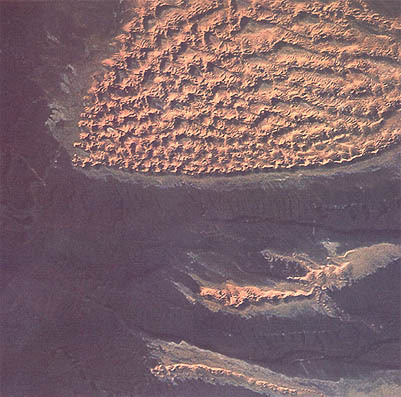 "This desert photograph of North Africa," says Astronaut JAMES A. LOVELL JR., is typical of the beautiful but desolate views this part of the world offers to the space traveler. The area was almost always free of clouds and a delight to photograph because it presented a vast array of brilliant colors with out haze obstructions. The photograph dramatically shows the results of wind and water erosion. For hundreds of miles one could see row after row of sand dunes surrounded by deeply scarred mountains. It was truly the most interesting area of the world to view from space." This field was in Algeria. "This unprecedented synoptic view of Lake Chad in Africa, says WILLIAM T. PECORA, Director of the U.S. Geological Survey, "illustrates a major contribution to broad-scale studies of hydrology in less-developed countries. The remarkable transitional nature of the eastern shore is easily seen. The land consists of sand dunes of various heights and configurations, and there is a gradual change from dry land to land with ponds, to land with bays, to bays with peninsulas and islands, to islands, to open lake. The westward limit of the submerged dunes shows the extent of the lake during past dry periods." 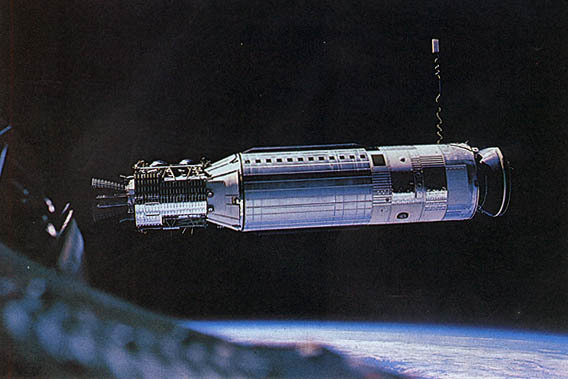 Another key event came March 16, 1966: The first dual launch and docking of a manned U.S. spacecraft with an unmanned target vehicle. The astronauts were Neil A. Armstrong and David M. Scott. The picture below was taken when the target was about 45 feet from the nose of their spacecraft (at lower left). "This Agena target vehicle," ARMSTRONG notes, "was the first unmanned satellite successfully photographed from space. 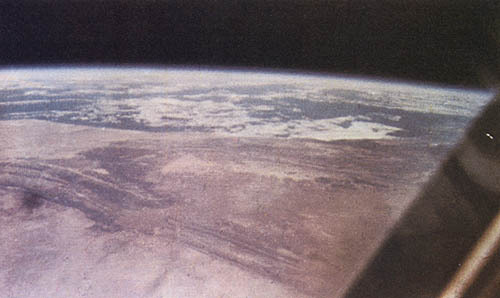 The picture was taken over South America by David Scott, just prior to the first successful docking of two spacecraft on the flight of Gemini Vlll. It clearly indicates the detail in which one satellite can be observed from another. This photograph is a particularly good replica of the actual view seen with the eye, with the exception of the brilliance of the white and metallic parts of the Agena, never yet captured on film." A short circuit in the orbital attitude maneuvering system that bled fuel through one thruster necessitated curtailment of the Gemini Vlll flight and the astronauts descended to a preplanned emergency landing area in the Pacific. A volume of memorable Gemini photographs would be incomplete without this one taken on June 3, 1966. WILLIAM C. SCHNEIDER, who is now Mission Director of the Apollo Program, explains this startling sight in this way: "Four hours and 8 minutes after liftoff, Astronauts Tom Stafford and Eugene Cernan had their first view of their rendezvous target, 'the angry alligator.' The shroud covering the target, the augmented docking adapter, had not separated and was held by a restraining band. Docking of the two vehicles was impossible. After a careful inspection and report on the conditions, the contingency flight plan was initiated and the mission continued. Two additional rendezvous, two extravehicular exercises, and five scientific and technical experiments were performed prior to a near-perfect reentry and landing." JAMES ELMS, former Deputy Associate Administrator for Manned Space Flight, who now directs NASA's Electronics Research Center, continues the account of that 1966 flight of Gemini IX in this legend for the photo below on this page. "After successfully completing their assigned rendezvous exercises, Astronauts Tom Stafford and Gene Cernan elected to conduct the first of two scheduled extravehicular periods on the third day. 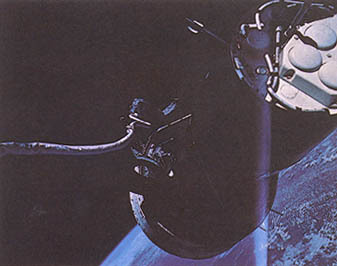 Cernan first performed several tasks involved with the evaluation of tether dynamics-notice the 'rearview' mirror attached to the docking bar and the movie camera attached beyond the hatch. Later Gene moved to the rear of the spacecraft where he attempted to don the astronaut-maneuvering unit, a back-mounted 'personal rocket.' Unfortunately, this task was harder to accomplish than anticipated and this extravehicular exercise was terminated."